.... It wasn't just me apparently, Blogger is having some issues at the moment. I have skirted around the problem by using a different browser. If only it would find the wordy part of the post that Blogger helpfully lost too! I intentionally made the two sides smaller than the cushion pad as I wanted to use a new contrasting colour on the edgings. I did this by making two trebles in the end of each row along the sides, once I had woven in all the pesky ends. So this is the finished result. I must say I was very pleased with it left it on the sofa for a few days so I could admire it! 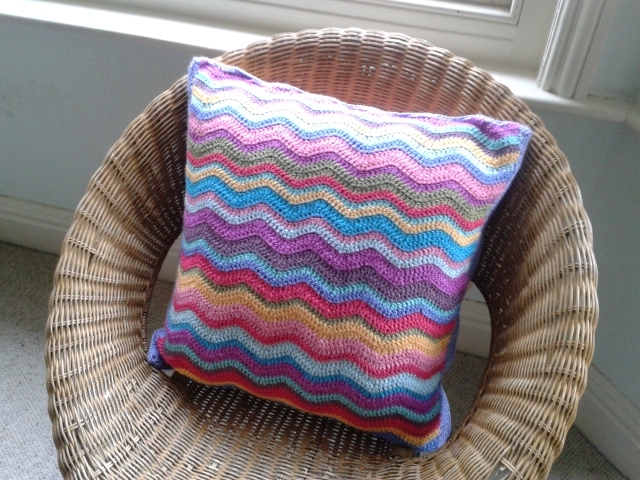 The recipient was pleased too and has requested more cushions on each birthday and Christmas for several years to come. 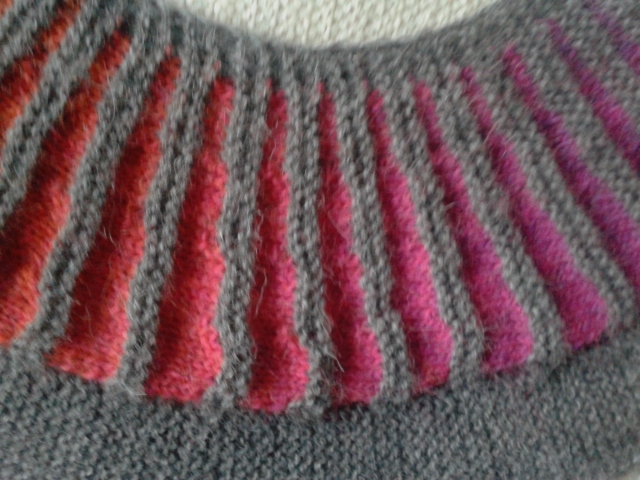 The next present was the Spectra scarf I was making for my daughter, which ended up being finished over the holidays. Again, I was really happy with the finished item so wasn't too cross when, after trying it on for the first time and keeping it on for all of seven seconds it was pronounced 'too itchy' and handed straight back to me! 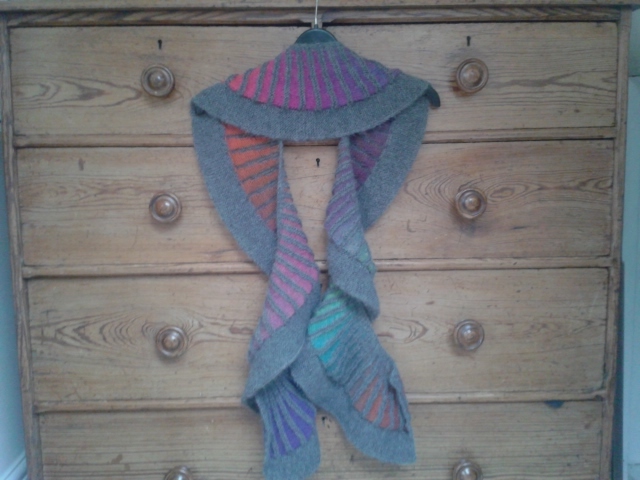 I've been struggling to find a way of photographing this scarf in a flattering way, it really does look a lot brighter in 'real life' and I love the way it drapes when worn. 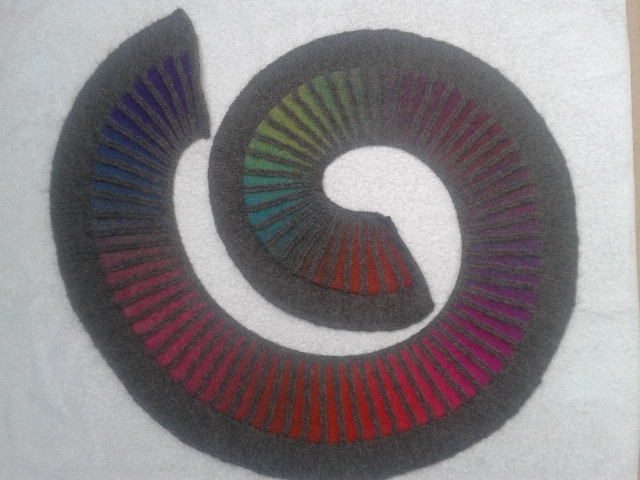 As predicted, I have enough of the colourful Poems yarn left over to make another, which I will probably do. 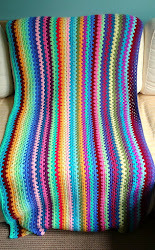 The next colourful creation is my Granny Stripe blanket, which gets the odd row added here and there when I can wrestle it away from whoever is snuggling under it of an evening (or afternoon, it has been in great demand by the various poorly Magpies who have been using it as a comforter). 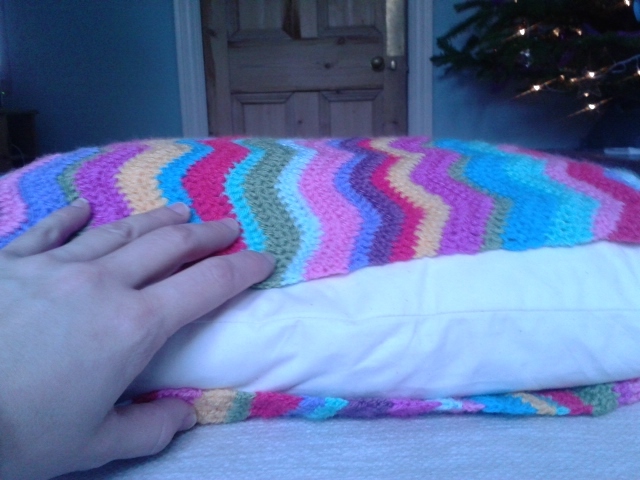 It really is huge now and unless I continue with my original plan to make it double-bed sized, I think I will be adding a border soon so that I can pronounce it finished. 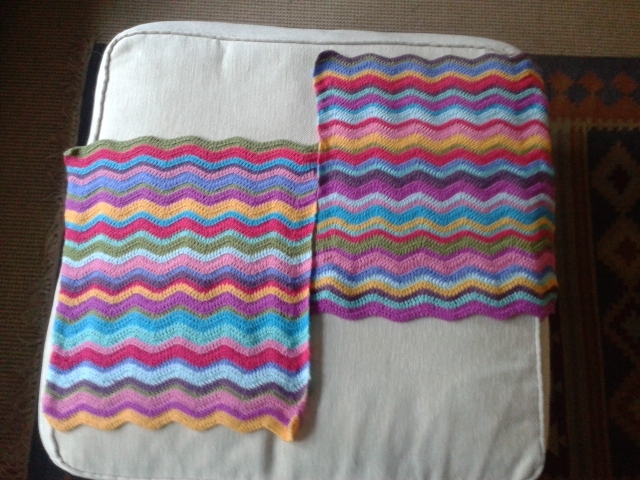 My thoughts have already been working out the next sofa blanket I need to make (necessitated by the arguments over the Granny Stripe) and I have been steadily stashing the Stylecraft ready to make a start. 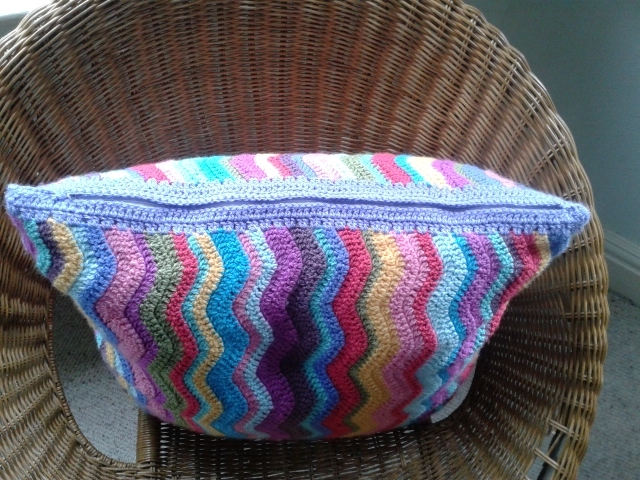 Until I make a decision, I have decided to embark upon my own crochet cushion covers and am planning to make several in different colours, but using the same group of colours for each, starting with the purple shades. To the untrained eye it looks as though I am rippling again. 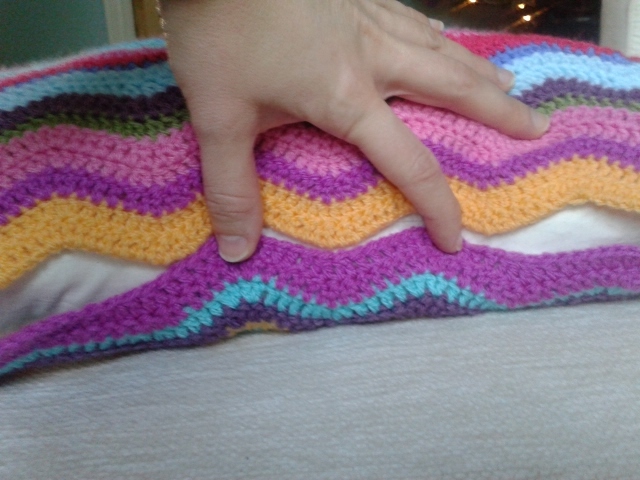 I am, but this time using a different pattern from my Handbook of Crochet Stitches. This pattern does a TR3TOG at the bottom of the valley, five trebles in between and a TR, CH, TR into the mountain, which produces the holes you can see below. Currently I am trying to find a combination of knitting pattern and yarn I like, but not having much success. Looks like the crochet will be taking over again! Hi Beth, I've just discovered your blog and love all your projects! 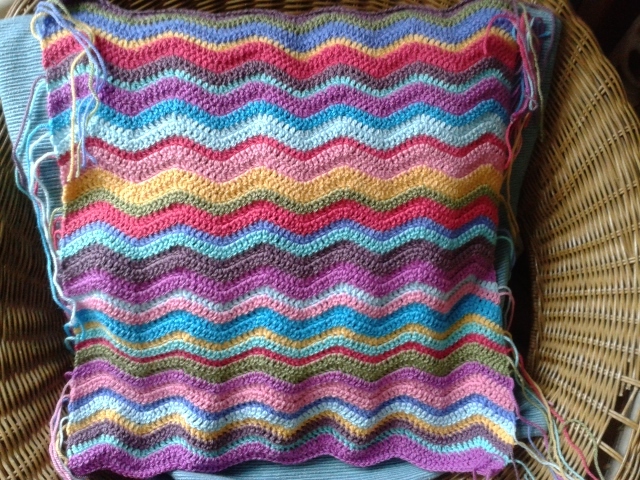 Your granny stripe blanket is lovely and cheerful, and I love the colours you're using. 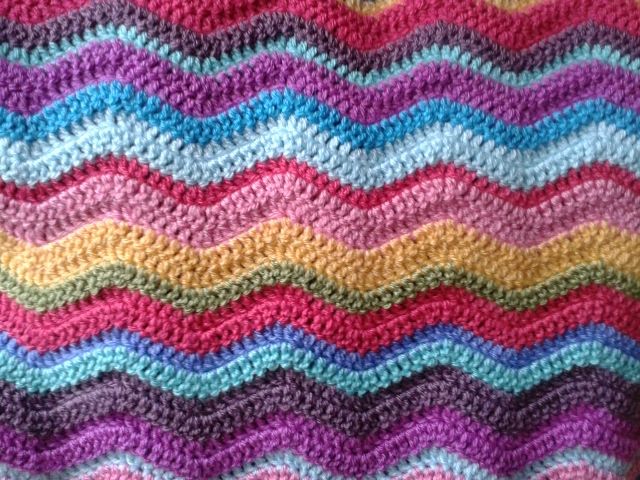 I have a similar problem wrestling my current ripple blanket from my Granddaughter to add a few more stripes! What fabulous work! I particularly love the cushion. Well done you. Hi there! Lovely to have you back! Beautiful blankie and I love the scarf. Good grief - what a busy magpie you are! 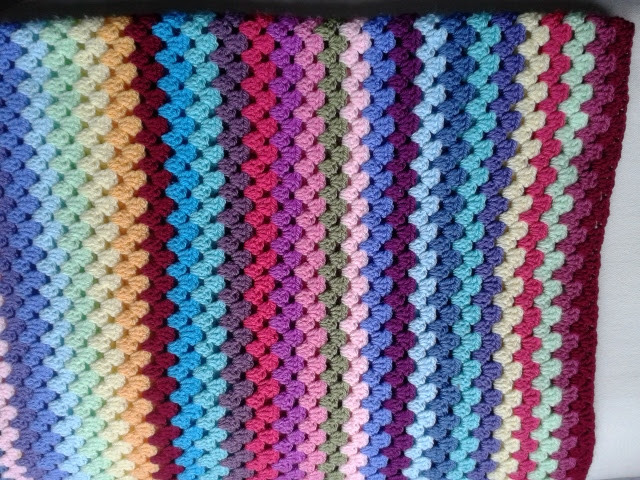 I must make a ripple cushion at some point - I'm trying to finish off lots of different projects before I try anything new but that looks very tempting. Your blog looks like a lovely colourful place to be so I'm off for a bit of a nosey around!